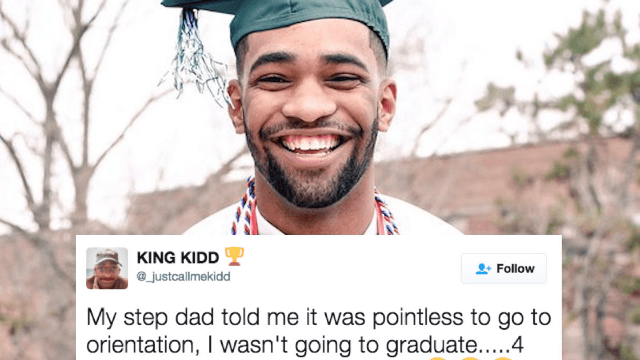 College student goes viral with brutal callout of his stepdad who said he'd never graduate. Daivon Reeder is a college student from Detroit, Michigan, whose stepdad apparently once told him it was "pointless to go to orientation" because he "wasn't going to graduate." This guy's stepdad sounds like a real jerk. But fear not, Reeder pulled off the perfect revenge. In a tweet that has since gone massively viral, he announced that he will be graduating this week with a degree in criminal justice and military science from Eastern Michigan University. But that's not all: he also updated us on how the ol' stepdad is doing and it's... not so great. "My step dad told me it was pointless to go to orientation, I wasn't going to graduate.....4 years later he in jail & I'm well...." the student wrote, along with a photo of him wearing graduation garb and a HUGE smile. The tweet has since been shared over 92,000 times. damn shame your step dad or anybody would say that. Congrats bro, go on to bigger and better things! Regarding the overwhelming response to his tweet, Reeder told Buzzfeed he thinks his story is one people can relate to. "I really do appreciate all the support. It makes these last few years worth everything," he said. "I'm just a first generation college kid from Detroit trying to beat the odds. I guess people can relate to a humble beginning." This guy's already killing it and he just graduated. I'd say the future is looking bright.